Words by Kevin Doocey on March 22, 2011 . I watched the whole ninety minutes of Newcastle United’s thumping at the Britannia on Saturday and was less than impressed as you would. We were dominated, looked heartless and make a desperate Stoke City team look like a team a division above us. Jon Walters header before the break was a great header from a great Jermaine Pennant cross; take nothing away from them. Sol Campbell was the wrong side of the Irishman for sure but even the best centre-backs in the world are caught out from time to time. A lot of stick was given to Sol throughout that game and it is very harsh to say the least. He gave a pretty solid performance for a guy who had not played in a considerable amount of time and some of his passing from his half was assured to say the least. As soon as Shane Ferguson tried to chase down the left wing and left a gap for Pennant to run into; I just knew it would was going to result in a goal. Experience will come with time for sure, but it was a foolish thing to do, especially when you are acting as left-back and have a responsibility to deal with their right-winger, not chasing down Rory Delap in the centre. The majority of the blame has to be laid at the door at young Ferguson, albeit learning all the time. Besides that though, Ferguson was sublime. He looks like the making of a new Jose Enrique, indeed he is quite reminiscent of a Jose Enrique in his first season with Newcastle United. He can get forward with a breeze as he did against Stoke, and has very very quick feet as we saw when he nearly scored a stunner of a goal. Harper’s mistake led to their second goal, and let’s be honest; no keeper in the world is stopping a free kick likes Danny Higginbotham’s, the sheer power and venom in the strike was far too quick for Harps to see. You certainly knew it was to be Stoke’s day when Higginbotham snatched one. With that said, it was a poor loss, there’s no defending that. However, as you would expect: there are gruelling reports pointing to Newcastle’s relegation. It seems as if the media are really just having some fun with NUFC. Less than five games ago, we were reported as being capable of clinching a Europa League spot in our first season. Now we’ll be lucky to stay in the league, and we will be bitting our nails to the finish. The table is too close to call, granted. However, we’re far better than the bottom three as we have proven this season already. Birmingham we have beaten, Wigan we have beaten and Wolves we haven’t lost against, in fact they are our next opponents. Wigan are a hopeless side, harsh but true. They try to play good football but they don’t have the players capable of it. They really do look destined to be relegated, and it would take something special to keep them in the league despite their crucial win last week. We have enough to stay in this league, and we will do exactly that. The likes of Joey Barton, Kevin Nolan, Fabricio Coloccini, Steve Harper, Shola Ameobi, Jonas Gutierrez and Jose Enrique will not let this happen again. In fact, I’d expect us to finish perhaps just below midtable, 12th even. Of course it’s within all realms of possibility that we could still go down but we would need to reproduce a Stoke City performance for each game until the end to do so. It sounds arrogrant, I know - but its the truth. I’m sickened hearing about all this pap, how the lads ‘were a disgrace’, indeed how ‘Sol Campbell should never wear a NUFC jersey again’. Some fans are so fickle its laughable. Thankfully, they only make up a tiny majority of the fans. We’ll start winning soon and we’ll confirm our status in the Premier League in the next few weeks or so. What’s the point of being pessimistic ? Total nonsense. 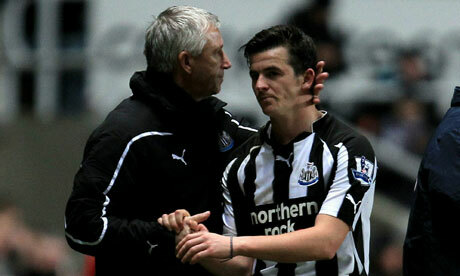 There has been a total under reaction to Pardew's crap form of 1 win in 10. Rubbish form, rubbish results, the togetherness has gone. A promise of two signings in the Jan window and we got a injured player that we won't see much of and a none rated player that we will see little of. Our strike force has a purchased price of 1 million. Our manager says he is good in disapline so that lads go clubbing. Oh and as a personal opinion the manager is tactically inept. So far I am not impressed with our latest gobby cockney. Bring on more bull for summer transfer window. Knee jerk reactions are what being a Toon fan is all about. I've supported them since I was a little boy in 1955. Following Newcastle is like being in love with an unfaithful woman we love them they let us down we hate them but then they do something nice and we love them again. Sorry, but Sol Campbell's performance was rubbish, layoff or no. Afraid to say Sol can't play again this season! 2 yards off the pace, makes it easy for any striker!